Photoshop - Photoshop provides free online photo editing application through Photoshop Express. Although it does not provide a full-featured as the desktop version of Photoshop, but it still has good features with the quality of photo editing tools simpler. A total of 2 Gigabytes (2000 Megabytes) are provided for storing users' photos online and of course are free to use. Pixlr - Pixlr has pretty good graphic designing features and photo editing tools, combining some editing programs from simple to high-quality. Express editor is perfect for beginners who want to edit photos and works similarly to the full version of Photoshop or GIMP with many different tools that can be used. BeFunky - It is free online photo editing site with interesting application that allows to edit photos, topography, audio and color. BeFungky is very suitable for those who already have knowledge of digital image manipulation, because there are features to manipulate images, and convert feature cartoons that are pretty good. iPiccy - This site is similar to with Pixlr, suitable for beginners, as it provides easy photo editing features without having to register. Edit photos, add effects images, text and other. PicMonkey - PicMonkey is touted as the replacement of the site Picnik (famous photo editing sites that have been closed). The feature of photo editor is presented more simple, fast, complete, and easier to use. PiZap - Pizap is equal to PicMonkey, free photo editing sites that are easy to use, allowing us to easily create unique photos with their digital images. Pizap is created specifically for users of social networks such as facebook, twitter and others. Picture to People - Picture to People" (P2P) is a huge Computer Graphics project. It was started to create new softwares able to make 2D drawing, 3D rendering, vexel drawing, text effects, photo effects, image filtering and other complex Computer Graphics operations. 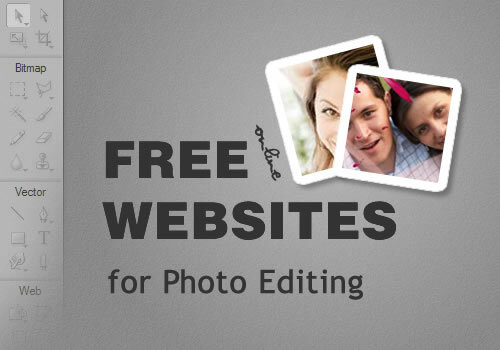 Pho.to - Pho.to site offers lots of free online services for photo editing, Pho.to offers a number of online services for photo editing, photo fun and sharing. All of them use the best digital imaging technologies and are designed to make your digital photography experience even more convenient and fun. FotoFlexer - It offers a fairly comprehensive photo editing, simple, low bandwidth but having a complete picture editing features. Combining simple and advanced features, Foto flexer allows users to create,organize, modify or change the photos from anywhere with an Internet connection because it is integrated with all the online photo services such as Flickr, Photobucket or Facebook. Pixenate - It is online photo editing application that allows uploading, downloading photos from other sites to be edited with less common editing features like cropping, re-sizing, brightness adjustments, drawing lines and others. Picture2Life - It provides all the features of a standard photo editing and adjustment tools to edit quickly. Editor panel displays all previews in photos,making it easy to edit photos that much. In addition, features photo effects are also complete not only Black White, Sepia, or there is also Checkerboard Blur, Fish Eye, or Kuwahara Which Is not found another photo editing site. LunaPic - This site features a unique animated photo editing, picture editing tools to allow users adding attractive animated effects to photos they wish to edit. It's just that most of the other features, either animated or usual photo editing is not accompanied by the instructions but it is easy if we already understand the function of photo editor. Phixr - This site allows basic operations such as cropping or resizing, deletion color, lens effects, blur, and more. Edit images directly by uploading from your computer or through the photo URL from another site. Polarr - Polarr Photo Editor is the most powerful, versatile, and elegant photo editing tool in the browser. Polarr can read and write large JPEG and RAW files up to 30MP and load a large quantity of photos in one session. Features include adjustments for color temperature, exposure, contrast, highlights and shadows, clarity, HSL channels, curves, distortions, vignette, local adjustments, adding watermark and signature and more. Ribbet - The application includes all the basic functions users expect, such as crop, resize, rotate and more. Users can also apply special effects that include moody or artsy filters as well as fun accents to go with their personal photographs. The service works on Macs, Windows and Linux operating systems and requires no downloads or installations.